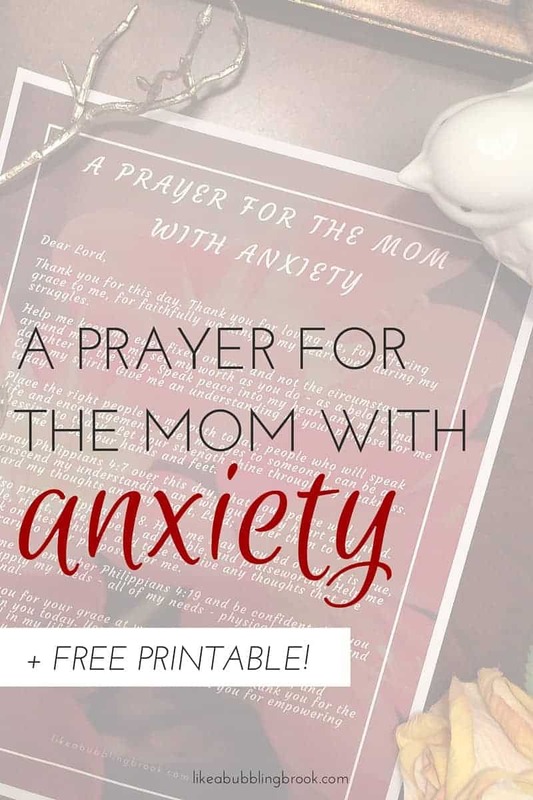 Are you a mom who struggles with anxiety? God created a special place in my heart for moms experiencing anxiety or depression. You are loved and cherished by God. Let go of the guilt and rest in His word today. You’re not inferior. Don’t believe the lies Satan throws at you. God’s grace is for you! It’s hard to pray when anxiety reaches a peak in your life. The words just won’t come. It’s important to stay in the habit of prayer during difficult times. Listening to worship music can help you get centered, but making prayer a priority – even if it’s just a few minutes – will help your prayer life grow and blossom. Thank you for this day. Thank you for loving me, for offering grace to me, for faithfully working in my heart even during my struggles. Help me keep my eyes fixed on you and not the circumstances around me. Help me see my worth as you do – as a beloved daughter of the King. Speak peace into my heart and my mind. Calm my spirit. Give me an understanding of your purpose for me today. Place the right people in my path today; people who will speak life and encouragement. Open my eyes to someone I can be a blessing to today. Let your strength shine through my weakness. Help me to be your hands and feet. I pray Philippians 4:7 over this day, that your peace will transcend my understanding and will guard my heart and mind. Guard my thoughts and my heart, Lord; I offer them to You. I also pray Philippians 4:8. Help me stay focused on what is true, noble, right, pure, lovely, admirable, and praiseworthy. Help me think on these things, and take captive any thoughts that are contrary to your purposes for me. Help me to remember Philippians 4:19 and be confident that you will supply my needs – all of my needs – physical, spiritual, and emotional. Thank you for your grace at work in my life, and help me to rejoice in you today. You are holy, righteous, merciful, and powerful in my life. Thank you for your peace. Thank you for the mercy you make new every morning. Thank you for empowering me for this day. Do you feel the Lord tugging at your heart to pray longer? Then keep going! Don’t stop. Psalm 34:4 – I sought the Lord, and he answered me; he delivered me from all my fears. Psalm 86:15 – But you, Lord, are a compassionate and gracious God, slow to anger, abounding in love and faithfulness. Philippians 4:11 – I have learned to be content whatever the circumstances. Precious mama, you are not “less than” or damaged goods. None of us are perfect. We all have struggles. Satan will try to whisper lies in your ear; fight them with prayer and the word. Use this prayer for anxiety until you can find the words for a prayer of your own. God has a plan for you! You are fearfully and wonderfully made by a God who loves you more than you could ever imagine! Click here to download the printable prayer. This is so encouraging. Thank you! I’m so thankful that you are posting on this subject. Depression and anxiety are overwhelming and have the potential to do serious damage to our faith. I love your recommendation to pray scripture as they contain the promises of God and recall his faithfulness and steadfast love. Great post, Jamie! Great post! So many times, depression and anxiety are suffered in silence because of the stigma society has placed on them. But you are right! God is still there and He still loves us! What a great collection of encouraging scriptures! When we are down there’s so much that weighs on us. These will help. Such a beautiful prayer! I do struggle with anxiety so I can relate. Thanks for the scriptures, too. It’s so important to substitute our lies with God’s truths. This spoke right to my heart, thanks for sharing! 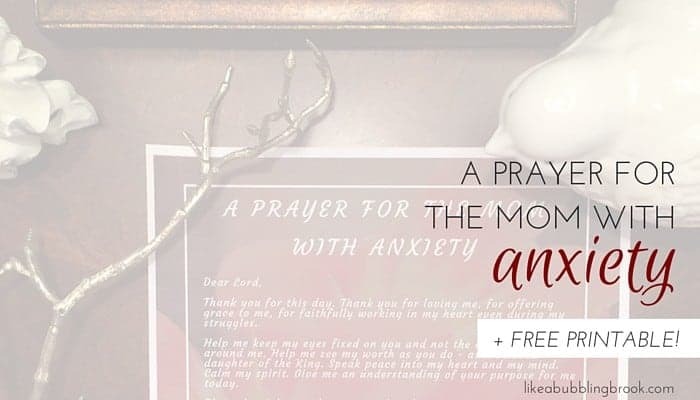 A great collection of scripture and a wonderful prayer to help during those times of anxiety. Thank you for sharing this hope!! !